One of the more interesting aspects of this extensive look back at rock history that we’re attempting to do here concerns the steps taken by the industry and its participants as a whole based on commercial returns swirling around them and how those business decisions had far-reaching creative implications as well. History tends to understandably focus on the artistic innovations of the performers themselves and how their bold new ideas shaped rock going forward, but sometimes equally vital in the effort to understand rock’s evolving story are looking at the choices that were made more out of economic necessity than artistic self-expression and how that often determined the music’s ultimate direction. In our recent review for Tiny Grimes’s Midnight Special, something of a turning point for Atlantic Records as it was the first official national hit they had scored in almost a year in business to this point, the underlying story was about how Ahmet Ertegun and Herb Abramson, the heads of the company, wisely defied the ongoing recording ban still in effect in order to get something on wax that was more in line with the dominant emerging styles that were defining rock ‘n’ roll and churning out hits for others in the early stage of its existence. This was really their first real astute move as a company which was floundering economically at the time. They spotted a trend, identified its components and set out to effectively replicate that with an artist more than capable of delivering on just such an idea, and did this all in spite of the presumed risk for breaking union edicts in place then because they understood they had no time to waste if they wanted to survive long enough to still be in business when the recording ban ended. It worked, both aesthetically and commercially. Long term it’d be the former that would receive the acclaim, showing the company was musically inclined enough to fit in with the emerging generation, but there likely wouldn’t have been a long term to speak of without the commercial reception that record garnered. With that decision leading to an immediate upturn in sales Atlantic was off and running, its economics shored up temporarily, but its mindset significantly altered forever. Now they attempted to do the same with Joe Morris, the man who’d given them their first mildly commercial noisemaker back in the spring with Lowe Groovin’ that essentially showed them this direction was viable in the marketplace to begin with. That the record itself was a bit underwhelming could probably be chalked up to uncertainty of how to approach it at the time, what to emphasize and how far to take it, all things which should be much clearer a half year later. By now there was ample evidence as to what was connecting with audiences and with the blueprint of how to tackle it most effectively having just been laid out by Grimes only a few weeks earlier (although the returns on it weren’t yet in), it seemed like a strong bet Morris and Atlantic Records would be able to hone things to perfection this time around. They didn’t quite pull it off from a musical point of view. But with that introduction building expectations I’m sure you could see that coming… the best laid plans and all that. On the surface The Applejack has all of the requisite components that were needed to compete in the rock sweepstakes. By most accounts it DID sell fairly well (it hit the Top Five in Pennsylvania for instance), and of course there were just 15 spots on Billboard’s Race Charts anyway, so for all we know the difference between Grimes Midnight Special, which hit at #12, and this record by Morris, which quite possibly only just missed those charts, might’ve been so slight as to be almost statistically inconsequential. But musically it was a different matter. For while Grimes and Morris used similar approaches, tight ensembles playing a groove-oriented instrumental with prominent sax work by two stalwarts (Red Prysock in Grimes case compared to Johnny Griffin, as well as Bill McLemore, who wrote this, on Morris’s record) the results don’t really connect somehow. Starting with horns churning in unison, over which Morris yells out the title twice followed by a boisterous “Let’s Go”, as if he’s rousing prisoners to riot, the song gets off to a promising start, capturing your full attention right out of the gate, but then doesn’t really take off from there. The title is taken from a popular dance at the time and maybe because it was created with dancers in mind is clearly intended to be more frantic throughout than Grimes’s mellower groove had been, so the success of something like this hinges on keeping the energy level high, never letting up on the throttle and if anything taking it up a notch or two by the end, yet this quickly settles into a sort of compromise in tactics. On one hand the horns are honking in an intentionally crude rhythmic pattern designed to appeal to the lowest common denominator (keep in mind that in rock that’s hardly a put-down), yet on the other hand they don’t take it over the edge into the kind of gaudy display that was already setting apart sides by the likes of Earl Bostic, Hal Singer and others. In other words its primary attributes – the down and dirty thrust of it all – wasn’t nearly dirty enough. The two saxes are locked in unison, but Griffin – the better of the two players – seems somewhat confined by this. Certainly the riffs aren’t difficult, there’s no high speed pyrotechnics involved, and it seems almost as if McLemore wrote it so that HE’D get to share in the spotlight since his baritone generally took the less glamorous supporting role to Griffin’s more flamboyant tenor sax leads. The result though sounds almost lethargic. Like they’re playing at half speed or something. The best bit comes in the bridge when Griffin takes a momentary detour from the monotony, something which sticks in your mind simply because it’s far more melodic than what’s been offered so far, not because it would really stand out on its own in any other setting. Actually Sylvester Hope’s piano is probably the most energetic aspect of this whole recording, pounding the treble keys with abandon to keep up the flagging energy. The song though can’t seem to decide on its course. The intent I think was uptempo mayhem like Hal Singer had recently done on Cornbread, but the riff The Applejack hinged on was too weighed down and more in line with the type of groove-oriented style of Sonny Thompson… or Tiny Grimes for that matter. We know that can work obviously if they focus on locking it down, keeping it churning relentlessly until you’re in a trance, yet they don’t accentuate THAT aspect of it enough either and because of the conflict between going all out and settling into a more churning riff they wind up pulling off neither, going both too far and not far enough in the process. It’s certainly listenable, fitting well enough into the overall instrumental motif that was so prevalent in 1948 to get some spins at the time I’m sure. I can’t claim to know the dance enough to deem if it’s truly suitable for actually dancing the applejack, but as a record it just doesn’t capture your attention by any means. When compared to just the average instrumental offerings of the year it comes up short and if matched up with one of the elite records of this style, the ones which collectively set the instrumental bar as high as it would ever get over a comparable period in rock, songs that were so addicting that they stayed in the Top Ten of the charts for months on end, this barely earns another listen. You’d put any one of those records on a second time, or a twenty-second time in a row to hear again before you’d have this break the spell those others had set. All in all it’s hard to comprehend how they didn’t come up with something a little more worthwhile musically than this. Atlantic Records had just shown with Grimes that they’d grasped the milieu that they were trying to capture here, yet they can’t elicit a similarly stellar groove from their best artist. Morris has a tight band with top notch talent and would go on to show he was perfectly at home in rock for years to come, but here he seems to acquiesce to one of its members, McLemore, who apparently viewed this as a way to ease himself into the spotlight a bit more, unwilling to admit that the role he was hoping to usurp was better left to tenor sax Griffin as opposed to his own baritone. Griffin, who typically didn’t find the type of crude displays rock called for to be that rewarding, might’ve even been glad to step aside a bit and let McLemore have more of the attention on this type of song. The main issue though seems to be that none of those involved – Morris, the band or Atlantic – seemed to scrutinize the results enough to spot the flaws and work to improve them over a few more takes, or overhauling the arrangement to emphasize the stronger aspects and jettison what didn’t work and was frankly holding this record back. Whereas the Grimes record hit on something that made it distinctive and if not quite ahead of the curve was at least on pace with the leaders in the field, The Applejack was content to merely attempt to jump on the proverbial bandwagon, offering nothing unique or daring, but rather just giving enough of what was expected so as to fit in, not stand out. Yet the dominance of the sax instrumentals in rock at the time meant it really didn’t seem to matter. This was the sound that was hot and by giving into the commercial needs, maybe in spite of their artistic goals, they found themselves rewarded. Though not an official hit The Applejack sold well enough to keep them all satisfied, giving Atlantic more evidence as to the most promising direction to pursue. It also kept the jazz aspirations of Morris and Griffin (epitomized by the desultory B-side Easy Riff) at bay awhile longer, which irrevocably changed their artistic pursuits going forward as well. That probably doesn’t sound like much in the big scheme of things – a modest selling record by artists who STILL were in search of their first legitimate hit released by a struggling independent label in a field that was growing in strength but as of yet with barely a track record worth betting your future on. Hardly a eureka moment where everyone involved suddenly saw the light and had a religious conversion. But in the fall of 1948 in these types of situations record companies and artists alike weren’t so sure of their choices to begin with and so the smallest sign of positive feedback took on much greater importance, in turn leading to more experiments in that realm, each one building upon the last and eventually establishing them all – artists, labels and the music itself – as a significant and worthwhile movement. Rock was shaped by hits not by records that were ambitious failures and for Atlantic, a company that was in all honesty as much of a hobby for its principle owner as much as anything up until now, these growing returns on a specific type of music is what determined their future. October 1948 was the turning point for the company thanks to two records with somewhat crass and decidedly more materialistic aims. That one was more artistically appealing, while this was decidedly less so, was irrelevant so long as the bills got paid. Even in something as revolutionary as rock the bottom line always wins out. 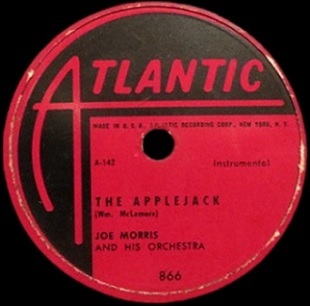 Leave a reply on "Joe Morris: “The Applejack”"